Smooth panels eliminate drawbacks inherent with plywood. The Premium Plate roll-up door features ½” polyethylene composite panels that are laminated with a high-tensile steel skin. The polyethylene core combined with the steel skin provide superior impact protection, as well as, puncture resistance. Another advantage of the polyethylene core is that it is not affected by moisture. Therefore, the Premium Plate door is resistant to warping or rotting. The Premium Plate's panels are pre-painted white and provide an excellent finish for graphics. The high gloss baked on enamel finish also includes an anti-mar compound which assists in the removal of graffiti. The Premium Plate comes with our industry standard heavy-duty 2” track and rollers. A fifth row of hinges (normally an upgrade) is included to provide additional support and increase the rigidity of the door. The Premium Plate from WHITING® is a strong composite alternative to the DryFreight model and is designed for increased security and longevity. 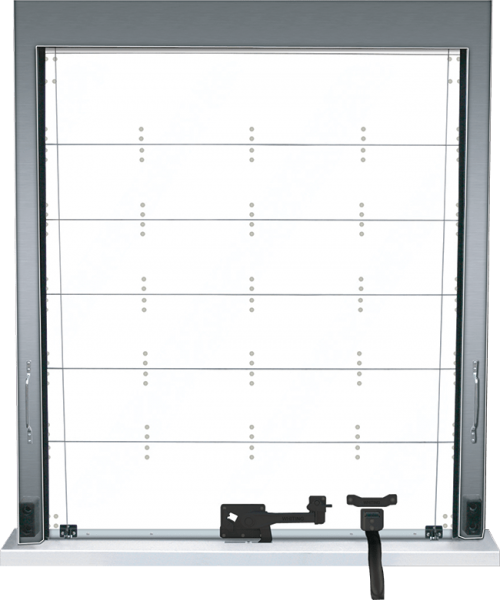 The Premium Plate is compatible with the CommandLIFT® power door-lift system.